I’m fortunate to call Richard Olsenius a dear friend, for he is both a wonderful human being, and one of the most profoundly talented and accomplished storytellers in America. A former World Press Photo winner, National Geographic photographer and editor, filmmaker, composer and musician, he sees, hears and feels the world with open and empathetic eyes and ears. He is a minstrel of both image, word and note, producing myriad visions, endless poems and countless scores, but even the most accomplished essayist has an epic. The tale of the Sheila Yeates is Richard’s, and it is riveting. 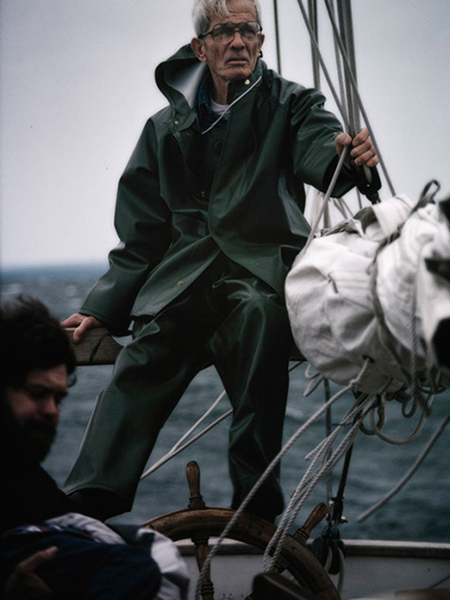 For Richard, his romance with Geoff Pope’s 30-foot ketch, the Sheila Yeates, began in 1978 on Lake Superior; the relationship with the boat itself ended in 1989 with tragedy. Yet his affair with the memory of the ill-fated—yet lucky—voyage of the vessel has remained an entity needing voice, and with his complex and moving multimedia story, “Icebound,” Richard and his wife Christine draw us into the profound power of the lives and events inexorably tied to the fate of a wooden craft. It’s a worthy hour or more spent with the spirit of exploration that lies deep within each of us. For my own life, I find the story both inspirational and motivational, reminding me why I became a photographer, artist and journalist: There are stories waiting to be found, and given life beyond simple voice. Just like that of the Sheila Yeates.